Equivalent to Cardiac Science 9141-001 Medical Battery. 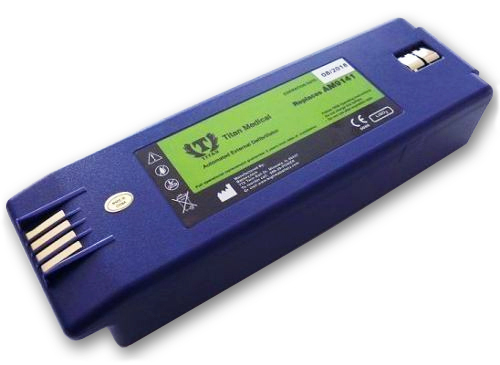 • Shelf Life: A new lithium battery pack has a shelf life of five (5) years stored at proper temperatures. Shelf life is defined as the length of time a battery can be stored, prior to installation into AED, without degrading its performance. Proper storage temperature is between 0°C to +50°C (32°F to +122°F). • Recommended Replace Interval: Three (3) years, depending upon usage. • Self Testing: With the lithium battery pack installed, the AED automatically tests it as part of the Daily Auto test. In addition, every 28 days a self test is performed to check the battery overload, electrodes, electronics, full energy charge cycle and software. • Proper Maintenance: Do not attempt to recharge! Do not use beyond the expiration date marked on the label. Do not expose to temperatures greater than 50 degrees Celsius (122 F). Do not allow electrical connection between the contacts, as it can blow the internal fuse and disable the battery permanently.